AlphaNinja - Disney announced they would purchase Marvel Entertainment (MVL) for about $4billion. While some skeptics are saying that many of Marvel's characters have reached the end of their useful life, Disney will now have access to Marvel's 5,000 lesser-known characters. Plenty of opportunity to exploit these assets. The price paid is about a 5% Free Cash Flow yield (and that's being generous by using 2008 numbers) and a PE of 21 -->> expensive yes, but not bad at all if Disney's scale and creativity can succesfully utilize Marvel's assets. One reason for the hefty purchase price is that a huge amount of the shares are owned by Issac Perlmutter, a man who wrestled control of the company away from the likes of Carl Icahn and Ron Perelman. Expect a guy like that to demand a nice payday to part with his shares. Disney CEO Iger, discussing reasons for the deal, among them being a push into more male-centric characters. AlphaNinja - Stocks down on weak Chinese market, and some exhaustion after big rallies off the March lows. Two big M&A deals give some positive news for the traders to digest. The year 1991 isn't only notable for the Gretzky/McNall purchase. 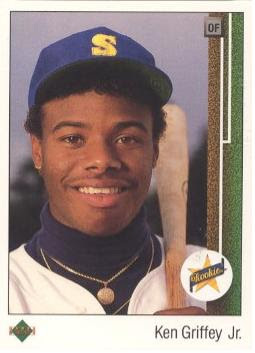 It also marked the peak year for baseball-card sales. According to estimates from Sports Collector's Digest, card sales amounted to $1.2 billion in 1991, but by the end of the millennium total sales had declined to $400 million, and last year sales dropped all the way to $200 million. For followers of economics, the modern history of the baseball-card industry offers useful lessons about market responses to profit, anti-trust laws, business failure and inflation. Wait, you're not supposed to "fudge" data??? What's the fun in that? "While the words in the comment were not well chosen, they were merely a prompt for the author of the Financial Statements to reconfirm the rounding difference expressed in an early draft of the Financial Statements where there was a minor rounding discrepancy. " REDWOOD SHORES, Calif.--(BUSINESS WIRE)--Saba Software, Inc. (NASDAQ:SABA - News), the premier people management software and services provider, today announced that it has repurchased approximately 4.7% of its outstanding shares of common stock. The 1,384,920 shares of common stock were repurchased by Saba directly from funds managed by FirstMark Capital L.L.C. in a negotiated transaction for an aggregate purchase price of $4.85 million. The repurchased shares have been retired and will resume the status of authorized but unissued shares of common stock. "Our recent share repurchase reflects continued confidence in Saba`s strategy and ability to execute as well as an ongoing commitment to increase stockholder value," said Bobby Yazdani, Chairman and CEO of Saba. "We believe that the current market value of our shares does not accurately reflect the underlying value of the company and that stock repurchased at this price will benefit stockholders." In fairness to Saba, yes, the market does not give the company much "valuation" credit. Net of its big cash holdings, the company trades at a Price-to-Sales under 1, a cheap number for a software outfit. The company announced earlier this year that it would partner with IBM, a potentially big development that sent shares from $1 to the current $3.50. Selling shareholders at FirstMark Capital probably figure this is a nice time to exit. 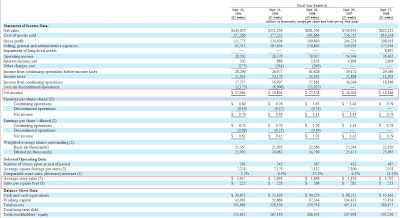 What's EXTRA nice for them is the sweet deal of unloading their entire stake directly to the company, instead of selling on the open market -->> the amount they sold is equal to over 8days of total trading volume in this stock, meaning it likely would've taken a long time to bleed shares to the market in order to avoid depressing the price. AlphaNinja - This morning, oilfield services company Baker Hughes(BHI) announced a $5.5billion merger with BJ Services (BJS). Baker Hughes shares are down 7.5%, so due to the stock-based nature of the deal it is already less valuable than the announced price. BHI shares are likely down due to the rich price paid. The agreement represents a premium to BJ Services stockholders of 16.3% over the closing price of BJ Services stock on August 28, 2009. Under the agreement, BJ Services stockholders will receive 0.40035 shares of Baker Hughes and cash of $2.69 in exchange for each share of BJ Services common stock. Upon closing, and reflecting the issuance of new Baker Hughes shares, BJ Services stockholders collectively will own approximately 27.5% of Baker Hughes' outstanding shares. 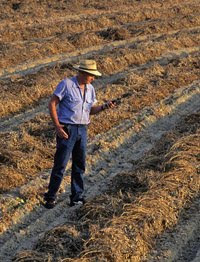 "Our two companies have highly complementary products and services with very little overlap. Baker Hughes has a long record of partnering with BJ Services on major projects. The proposed merger will make Baker Hughes a stronger, more efficient service provider for our customers worldwide, by integrating pressure pumping with Baker Hughes' wide range of products and services." Baker Hughes expects to realize annual cost savings of approximately $75 million in 2010 and $150 million in 2011 as it eliminates redundant costs, consolidates facilities, and further rationalizes field costs. Baker Hughes expects the combination to be accretive to earnings per share in 2011." 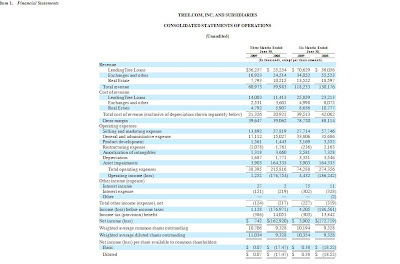 From a Free Cash Flow perspective, the deal looks pretty rich. This year's net income is estimated at about $200million and 2010's at $150million, both down significantly from the 2006-2008 timeframe. Factoring in continued high capital expenditures and there simply is not free cash flow generation. Baker Hughes is likely assuming at least partial reversion to previous years profit levels, and will probably cut Capex and operating costs in a bid to make this deal a winner. AlphaNinja - US stocks look to open down about 1%, following a 6.7% drop in Chinese shares. Oil is down to $71 on fears that the economic recovery is in doubt. One man continues his fight against Google, at his new firm. Despite good intentions, phasing out incandescent light bulbs may not save much energy, while offering lower quality light. Investment banks saw the worst August since 1994 in terms of M&A deals. An oil expert doesn't see the world weaning itself off the commodity anytime soon. Some Tribune creditors will make the legal argument that the company was basically insolvent at the time of the LBO deal. With Ralph Lauren's US sales flattening, they see their underpenetration in Asia as a big growth opportunity. AlphaNinja - Yesterday, Select Comfort shareholders voted down a proposed equity issuance to Sterling SC Investors. Now I admit the company is in dire straights in terms of financing - bankruptcy is a real concern if they can't obtain some $$$$$. The debt markets would be prohibitively expensive for them,given their balance sheet's lack of quality. So that leaves the equity market as the last resort for "save your a$$" financing. For equity holders this is key -->> if your stock is trading at low levels because the market thinks the company is going bankrupt, then hugely dilutive (issuing tons of new shares reduces your stake) stock issuance, IF IT TAKES BANKRUPTCY off the table, is a good thing. That said, the terms of this deal were simply offensive. With the stock trading at just under $3, the deal would have sold shares to the new investors for just 70cents per share. Granted, the deal terms were worked out while the shares traded lower, but shareholders were right to turn this down. SANTA CLARA, Calif.--(BUSINESS WIRE)--As a result of stronger than expected demand for microprocessors and chipsets, Intel Corporation now expects revenue for the third quarter to be $9.0 billion, plus or minus $200 million, as compared to the previous range of $8.5 billion, plus or minus $400 million. The gross margin percentage for the third quarter is expected to be in the upper half of the previous range of 53 percent, plus or minus two percentage points. With large fixed costs, Intel's gross margin increases quickly with higher than expected revenues. Intel's earnings per share for 2009 are estimated at about 56cents - about to rise thanks to this preannouncement. 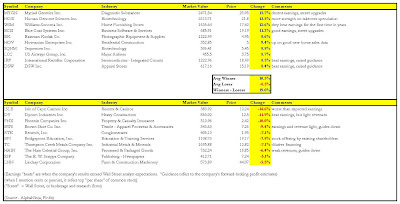 2010 earnings estimates are pegged at 1.12. Those figures lead to Free Cash Flow of $4.2billion and $7billion in 2009 and 2010. Taking the higher 2010 estimate implies a FCFY(Free Cash Flow Yield) of 7.6% based on the company's (net of cash) $92billion market value. Not the kind of yield I chase. 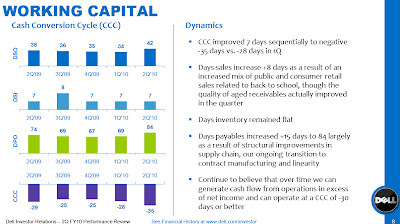 AlphaNinja - Dell's results last night were pretty good - a high quality beat on revenue, gross margins and earnings. The shares are up 2.5% today, while the broad market is down almost a percent. -->>UBS notes Dell should benefit from the desktop refresh cycle (they feel may still be overstated). Near-term, they believe Dell will continue to see lumpiness in rev & margins as it continues to transition, its end markets continue to see pressure, and as it continues to invest into growth markets & channels. They have raised their tgt to $16 from $14.50; they reiterate their Neutral rating. AlphaNinja - Dell's (DELL) earnings of 28cents per share (including 4 cents per share for cost reduction expenses), beat the consensus estimate of 23cents. The earnings beat was high quality because they actually beat on revenue and gross margin, instead of simply slashing costs. 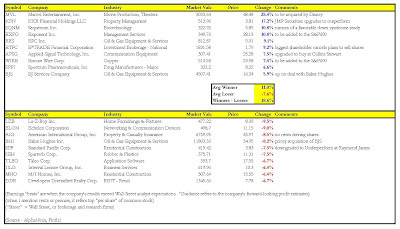 -->>"Gross margin was 18.7 percent of revenue as strong improvement in cost of goods sold, disciplined pricing, a sequential increase in sales from enterprise products, and a $69 million buyout of a revenue-sharing agreement by a vendor offset previously highlighted pressure from component costs, competitive pricing and revenue mix in client systems." Operating cash flow was $1.1billion, and end-of-quarter cash and investments totalled $12.7billion, or 42% of today's market value. Despite the good results, Dell is not yet ready to call an inflection point, and they see the much-anticipated PC refresh cycle as a 2010 story, disapointing some who were hoping for a back-half of 2009 boost. As usual, my biggest problem with this company is that they continually cannot make cash from operations in excess of net income - they say it's coming but it's still a ways off. So for my valuation using FCFY(Free Cash Flow Yield), I go back and update share count and cash balances for the last four quarters. 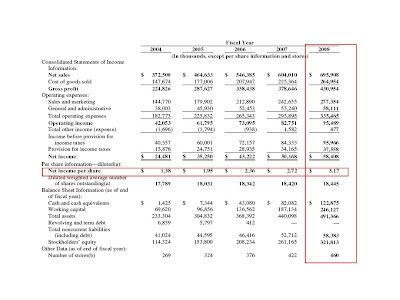 I use a Free Cash Flow number that looks backward and forward, getting to $1.8billion. That's going to be conservative for 2010, but I'm fine with that. As the chart shows below, we get paid to demand a higher yield. When DELL shares fetched less than $9 back in March, the market seemed to forget they had $5 a share in cash, for a net stock price near $3!!! That pushed the FCFY to over 30% for a few days. I didn't catch the stock there, but did note on May 28th that "The stock is a big-time BUY, and could be a double within the next year." Back then the FCFY was about 17%, what I considered to be WAY above their cost of capital of 5-6%, as they demonstrated by tapping the debt market. AlphaNinja - Boeing (BA) shares comprise 3% of the Dow Jones Industrial Average, and are up 9% today -->> responsible for the entire 28basis point move in the index. Boeing said its 787 Dreamliner will be ready for a test flight by the end of the year, and the market received the news well. Expected 2009 Free Cash Flow of about $3.2billion indicates an FCFY (Free Cash Flow Yield) of 10% -->> a pretty decent return compared to money markets and other piddly yields. Let's hope the delays are done, as Boeing does not need any more negative news. Gulf Air, losing $1million per day, is "reviewing" its order plans. PORTLAND, Ore., Aug. 26, 2009 (GLOBE NEWSWIRE) -- Precision Castparts Corp. (NYSE:PCP - News) has agreed to acquire Carlton Forge Works (Carlton) and related entities for $850 million. "Carlton is a critical strategic asset that we have aggressively pursued for several years," said Mark Donegan, chairman and chief executive officer of Precision Castparts Corp. "Ring rolling has been a distinct gap in our product portfolio, and Carlton, the technology leader in that market, will enable us to provide a full range of products to our engine customers. Carlton has also been very successful in building its market positions on all major programs currently in development, including the Boeing 787 and Airbus XWB. "Carlton significantly broadens our forging capabilities, and, with our combined strengths, we can attack markets that we haven't been able to penetrate individually," Donegan continued. "Our Wyman-Gordon forging operations will share best practices with Carlton, and we can bring Special Metals' and Caledonian's strengths to bear in significantly reducing Carlton's material cost structure. In addition, with seven other PCC manufacturing operations in southern California, we will be able to leverage our growing economies of scale in that region." A woman who has been missing from her South Lake Tahoe home has surfaced in Concord, 18 years after she was kidnapped, and two people are apparently in custody, her stepfather said today. 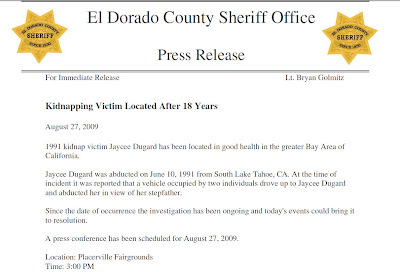 Jaycee Dugard, who would be 29 today, walked into the Concord Police Department on Wednesday, stunning police and family members who had all but lost hope that she was still alive. Dugard's stepfather, Carl Probyn, 60, of Orange (Orange County) told The Chronicle today that his wife, Terry, called him at about 4 p.m. Wednesday with the news he never though "She basically said, 'Are you sitting down?' I said, 'Yes.' And she said, 'They found Jaycee - she's alive." The two, who are separated, cried for about two minutes on the phone. 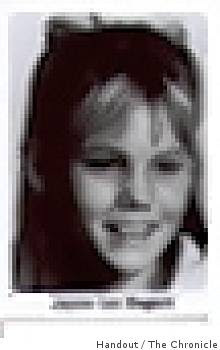 Dugard was last seen on June 10, 1991 as she was walking to a bus stop in South Lake Tahoe. Dugard, a blue-eyed, blond 11-year-old dressed in a pink top and pink pants, set out to catch the bus to her school near South Lake Tahoe. She never made it. As Probyn watched helplessly from the family's driveway on a hill about two blocks away, a two-tone gray sedan pulled up and someone yanked the girl into the car and sped off. Even though officers responded within minutes, no trace of the car or girl was ever found. Here's an Economist piece written by a good friend of AlphaNinja. Similar to the S&L fiasco of the late 80's/early 90's, it appears Georgia banks got into trouble thanks to "brokered deposits." SUMMER in America’s deep South is usually a mixture of backyard barbecues, baseball games and sweet tea. This year, however, there has been no respite for regulators trying to contain the banking crisis. On August 21st BBVA, a Spanish lender, agreed to rescue, with government support, Guaranty Bank, a failing Texan firm with $12 billion of deposits. Across the Gulf of Mexico, in sweltering Georgia, things look worse. The state accounts for a fifth of the 100 or so bank failures in America since the start of 2008. There may be more to come. Each week the Federal Deposit Insurance Corporation (FDIC) announces more failures in America. It has a secret list of more than 300 “problem banks” that are at risk of going broke, most of them small-town lenders. To identify bad banks, analysts are again using the “Texas ratio”, which compares non-performing loans to core capital and was popularised in the savings-and-loan crisis two decades ago. An alternative is to track where the FDIC sets up temporary offices. One is in Irvine, California, close to IndyMac Bank, which failed last year. There is a 500-man operation in Jacksonville, Florida, that has been placed deliberately close to Georgia. What explains the FDIC’s modern-day siege of Atlanta? There were “too many banks to begin with,” says Dan Blanton, the head of Georgia Bank and Trust, a local community bank. Until the late 1990s most banks were run with county charters which restricted them from branching outside their own small patches of turf. Even today each of Georgia’s 159 counties has multiple banks to provide locals with southern hospitality, mortgages and current accounts. According to Joe Brannen of the Georgia Bankers Association, Georgians have “more affection for community banking” than people elsewhere. Many of these community banks became overextended during the state’s economic boom. Over the past decade Georgia’s population has grown by 1.5m; thousands are still thought to be moving in each month. Property development surged in tandem. Georgia’s small banks were unable to meet the increasing demand for construction loans with slow-growing local deposits, so they began to offer high-yield certificates of deposit to out-of-state customers. As a proportion of funding, Georgia’s banks were twice as reliant on these as the average American bank. When the financial crisis struck, this “hot money” quickly left the state. Although small, community banks were not isolated from systemic problems. They banded together in “participations”, a kind of multi-bank loan particularly common in Georgia, thanks to Silverton Bank, a prominent broker of syndicated deals. Known as the “banker’s bank”, Silverton was founded by a consortium that included about 200 Georgia lenders. When it was forced to liquidate in May, with more than 500 such group loans on its books, it caused a systemic problem for other banks in the state. Some of the defaulted loans were obscure and fiddly. One involved more than 60 Georgian banks funding land acquisitions on the outskirts of Phoenix, Arizona. Yet whatever the structure of Georgia’s industry, the root cause is that bankers just got too optimistic. Banks fail, Mr Blanton says, when they “let the bucket fill up too much.” With few healthy banks left locally the most likely buyers of struggling lenders are outsiders, including foreign banks keen to expand their presence or private-equity firms. That latter prospect improved on August 26th when the FDIC agreed to lower restrictions that had been proposed for non-bank investors. Even then, however, for Georgia’s banks things are pretty far from being peachy. AlphaNinja - Markets down. DJIA down half a percent while the Nasdaq is down a bit over one percent. Among losers is Human Genome Sciences (HGSI). Traders have been pushing the shares higher in recent days on speculation that GlaxoSMithKline would buy the company, but rumors are flying today that GSK has not actually held talks about a buyout. AlphaNinja - Lending Tree (TREE) shares are down 7% this morning, after the company said it is suing a technology provider who has shared data with Google. The company is right to be concerned if Google is entering the lending game. "A LendingTree lawsuit against a separate technology provider claims that it has learned Google plans to launch such a service later this month or in early September. The lawsuit claims that LendingTree has received screen shots -- pictures of a computer screen -- showing a trial version of Google's service that indicate Google will give customers loan offers and contact information for lenders. Google Inc. issued a written statement Wednesday saying it is "working on a small ad unit test" involving a limited number of mortgage-related searches. "We have a number of experiments going on at any one time, but we don't speculate on future product development," the company said. We'll what kind of economic "moat" (competitive advantage that can't be easily replicated) Lending Tree has. While the company is quite profitable, that only leads others to the space, reducing profits and increasing competition. AlphaNinja - US stocks opened down a little over half a percent. GDP dropped 1% in the second quarter, slightly better than expected. Chinese stocks were down, as the government said it will cut excessive investment in certain industries. 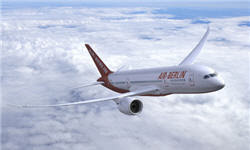 Amidst yet another delay, Boeing will take a $2.5billion charge for the delayed 787 Dreamliner. Shares higher though. Good news - as the cost of solar panels drops, the need for it to be "legislated" into use (versus being cost effective) is reduced. Having pillaged US taxpayers to pay for the Cash for Clunkers, program, Ford is attempting to have the Europeans throw money their way also. Aug. 27 (Bloomberg) -- Ford Motor Co. is lobbying European governments to extend consumer sales incentives to avoid a new market collapse when the programs end, according to the U.S. automaker’s top executive in the region. What is flash trading? As pioneered by the electronic communications network Direct Edge, it is simply a way for one customer to query other customers to see if they will take the other side of a trade. Tribune bondholders want to investigate Sam Zell's $8.3billion buyout of Tribune Co.
Zell’s leveraged buyout and “the unsustainable debt burden imposed on a business already in a secular decline undoubtedly caused” Chicago-based Tribune’s bankruptcy, the bondholders said in a court filing yesterday in Wilmington, Delaware. They hold more than 18 percent of the company’s bonds, according to the filing. Ireland's dependable economic indicator show citizens leaving to find jobs. Sean McManamon left Ballycroy -- a picturesque village sandwiched between the Atlantic Ocean and the Nephin Beg mountain range -- for a job in London in February after his small construction firm folded. Mr. McManamon, a midfielder who was a stalwart of the Ballycroy team's defense, emigrated around the same time as three other players, leaving the village without an adult team for the first time in more than 50 years. AlphaNinja - Northern Trust (NTRS) announced today that it has fully paid back the US taxpayer, and that they really didn't need need the help after all. CHICAGO, Aug. 26 /PRNewswire-FirstCall/ -- Northern Trust Corporation (Nasdaq: NTRS - News) announced today that it repurchased for $87 million the warrant issued to the U.S. Treasury to purchase approximately 3.8 million shares of common stock as part of the TARP Capital Purchase Program. With the repurchase of the warrant today, Northern Trust will have paid to the U.S. Treasury an aggregate of more than $1.709 billion, which includes the repurchase of the preferred stock and the warrant together with all dividends paid on the preferred stock. In aggregate, the Northern Trust payments represent a 14 percent annualized return on investment to the U.S. Treasury and taxpayers. "Although Northern Trust consistently has been a healthy bank, we participated in the Capital Purchase Program to support an important element of the government's effort to stabilize the nation's financial system at a critical time." Well if we're going to be doing "bailouts," or offering "stimulus," this is the way to do it - we're paid back within a year and the taxpayer made 14% annualized....not bad. AlphaNinja - Just not in the way you'd think -->>they're busy spending their citizens' tax dollars at the world's most expensive hotels in a selfless bid to prop up the global economy. Those brave "public servants!" In an annual survey by Financial News' sister publication Wealth Bulletin, the Royal Penthouse Suite at the President Wilson Hotel in Geneva, Switzerland, tops the list as the most expensive hotel room in 2009, commanding $65,000 for its four-bedroom penthouse -- twice as much as patrons paid a year ago for its luxurious setting and views of Lake Geneva and Mont Blanc. Hoteliers said that although the number of business travellers has fallen in the past year, government officials have taken their place in the best rooms and suites. Variety has learned that London-based production company The Shine Group just picked up a new reality series starring Encino Man star Pauly Shore. According to the trade paper, "Adopted" will chronicle the ’90s goof’s efforts to adopt an African child. AlphaNinja - Short sellers (betting on a stock going down in price) employ many different strategies. Some short the stocks of great companies that might simply be overpriced, like JCrew or Monsanto. Others short stocks that they consider to be "ZEROS," or companies that they are convinced are going bankrupt, sending the shares to 0. That's the only way you can be comfortable shorting stocks that are trading below $1. Shares of Gray Television (GTN) are decimating shorts today, up 43% or 28cents! In fairness, no one in their right mind would make this a massive percent of their overall portfolio, so this is probably hurting certain funds no more than 1-2% today at worst. GTN has seen 6.2million shares traded already today in 3hours, and the NYSE asked the company to explain. Gray Television had no comment. AlphaNinja - Markets gave up all their inital gains, now trading slightly in the red. Among gainers was a healthy earnings report from Williams-Sonoma! (WSM). About time. AlphaNinja - Oh how I do attempt to stay non-political! I'll justify this one by citing the words at the top of my site, "Stocks and Free Markets." A stretch, probably, but our government's spending (and the taxes that'll support it) is worth looking at. Yesterday the White House's OMB released a "mid-year" update in which they proudly take credit for reducing this year's deficit (solely due to less money being loaned to troubled banks). Here's the link to the update, in which the term "inherited" (as in, our administration "inherited" all their financial problems) is used three times in one short blog post. The MSR shows a smaller 2009 deficit but larger out-year deficits than previously projected. Overall, it underscores the dire fiscal situation that we inherited and the need for serious steps to put our nation back on a sustainable fiscal path. First, let’s consider this year’s deficit. We now expect that the policies put in place to repair the financial system are likely to cost taxpayers less than previously anticipated. In particular, we have decided to remove from the budget a placeholder for further financial stabilization efforts that seemed prudent earlier this year. And we have lowered our estimate of the expected costs of FDIC bank rescues. The net result is a $262 billion improvement in the projected 2009 deficit. The 2009 deficit is now projected to be $1.58 trillion – or 11.2 percent of GDP – down from a previously projected $1.84 trillion or 12.9 percent of GDP. That's all well and good. But Reuters and others have pointed out an astonishing fact -->> the administration includes "$627 billion in revenue between 2012 and 2019 from a so-called cap-and-trade system requiring companies to buy permits for the carbon gases they spew into the atmosphere." This has not even been voted on in the Senate, which is consistently more level-headed than the House. It's an administration projecting extra "revenue" (never taxes, always "revenue") from some obscure regulation that has never been passed into law. If (more like when) Congress decides that climate regulation is too harsh to be implemented, the White House will adjust its numbers to reflect reality. Thanks, guys. An OMB official said the budget review essentially assumes the full implementation of Obama's campaign promise. "To the extent that Congress enacts a different proposal, we'll adjust the budget accordingly at that time," the official said. AlphaNinja - Several new 13G filings indicate some opportunistic purchases of Huron Consulting (HURN), after the stock plummeted almost 70% in a day on some very bad news. 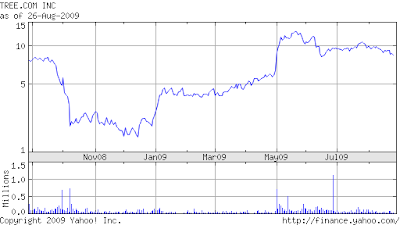 Huron shares are up about 2.5% today, as people may be excited by Citadel's involvement. The stock jumped massively around the recent earnings report as people realized the selloff may have been overdone in relation to the news, and the shares have underperformed the general market by over 10% since that run. A couple days ago, Avondale upgraded the shares and put a $25 price target on them, which would be a nice gain from today's $19 and change. Like the rest of wall street, they "let the dust settle" after the earnings restatement, and the stock subsequently jumped 40-50%. Can't blame them for being cautious. AlphaNinja - Stocks are about to open slightly lower. Durable goods orders were strong, but excluding the government-manufactured auto sales increase, they were in line with expectations. Recession is hitting people everywhere, especially those who took on big debt for law school. Live free or move. Americans in London are leaving the UK as tax rates on high earners rise above 50%. Raining on the parade, the NYTimes points out that the improved home sales data was "goosed" by the $8k first time home buyers credit, as well as the lower-end part of the market falling too fast to quickly. 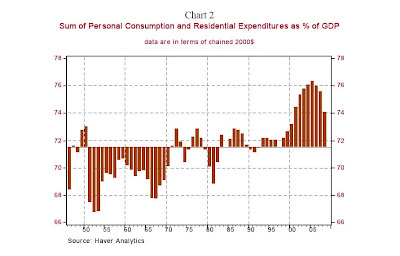 Homebuilders see some light at the end of the tunnel? “We decided to build it out ourselves,” said John Bayless, president of the Sacramento division of Signature Properties, a closely held developer in Pleasanton, California. “Our feeling is, ‘The tide’s turning. Let’s build ‘em.’” Homebuilders that spent the past three years selling off land and writing down the value of property holdings are scouring markets in Sacramento, Phoenix, Denver and Orlando -- cities synonymous with the real estate bubble -- looking for deals on ready-to-build lots as they prepare for a rebound. More insane spending by California's public schools, and they turn around and blame the greedy banks. Some districts spent millions of dollars from refinancing not to upgrade classrooms but to purchase administration buildings and build sports stadiums. Those decisions overrode requests from school board members and parents to support more urgent needs -- such as fixing leaky roofs, replacing faulty electrical systems, modernizing science labs and increasing security at schools where student violence had flared. The Moreno Valley Unified School District, a 39-school system in Southern California, used 90 percent of its $6.5 million in cash to build a 3,000-seat outdoor stadium equipped with a wireless videotaping system for football games. AlphaNinja - Stocks volatile today, up near their highs however, about a percent positive. Decent news from consumer confidence indicators and home sales are winning out over a bleaker-than-previously-thought economic report from the White House. AlphaNinja - I know I keep coming back to this situation, but part of the theme of this website is the notion that common stockholders be respected and protected. Apax Partners Successfully Completes Tender Offer for Shares of Bankrate, Inc.
"NEW YORK, Aug. 25 /PRNewswire/ -- BEN Merger Sub, Inc. and BEN Holdings, Inc., corporations whollyowned by funds advised by Apax Partners and formed for the purpose of acquiring Bankrate, Inc. (Nasdaq: RATE - News), today announced the successful completion of the cash tender offer for all of the outstanding shares of common stock of Bankrate at a purchase price of $28.50 per share in cash"
The depositary for the tender offer advised that, as of the expiration time, 5,397,131 Bankrate shares had been validly tendered and not validly withdrawn (including 635,671 shares tendered by notices of guaranteed delivery). These shares represent approximately 28% of the outstanding shares of Bankrate. All shares validly tendered and not validly withdrawn in the tender offer have been accepted for payment by BEN Merger Sub. 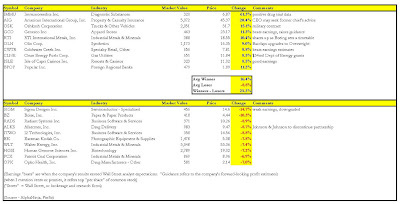 An additional 4,571,476 shares, approximately 24% of the outstanding shares of Bankrate, are owned by directors and senior managers of Bankrate subject to Non-Tender and Support Agreements under which BEN Merger Sub, as of the acceptance time of the offer, has an irrevocable proxy to vote, giving BEN Merger Sub voting control of approximately 52% of the outstanding shares of Bankrate. From today's release -->> thanks "Florida Law!" BEN Merger Sub has also advised Bankrate that it has exercised its "top-up" option granted under the merger agreement pursuant to which Bankrate has agreed to issue shares to BEN Merger Sub in an amount sufficient to achieve at least 80% ownership plus one share and permit the completion of a "short-form" merger under applicable Florida law, without a vote of the shareholders of Bankrate. Accordingly, after providing 30 days' notice to shareholders as required by Florida law, BEN Merger Sub intends to acquire the remaining shares of Bankrate common stock through a short-form merger in which all remaining Bankrate shareholders who did not tender their shares in the tender offer will receive the same $28.50 per share in cash, without interest and less any applicable withholding taxes, paid to shareholders tendering in the tender offer. AlphaNinja - In a turnaround, JoS. A. 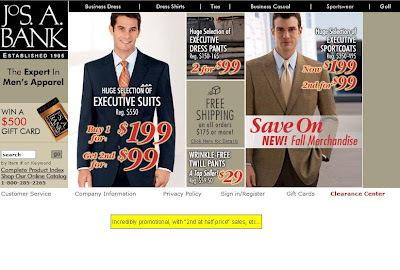 Bank Clothiers (JOSB) has increased its Fiscal 2010 expansion plans to 30-40 stores from the previous 10-15 planned openings. “Quality real estate opportunities are beginning to open in the marketplace and we are ready to expand our store base at a more rapid rate. We believe we are poised to take advantage of these opportunities as a result of our strong financial position. We have a proven ability to open 60 stores a year and these future store openings will put us back on the track we were on prior to the national economic crisis,” continued Mr. Black. JOSB currently operates 467 stores, and is aiming for 600. Net income per store has risen from $91k in 2004 to $126k in 2008 and is still rising as the store base ages and becomes more profitable. At 600 stores I could see JOSB doing at least $100million in net income, or almost 5.50 per share versus 2009 expectations of 3.46. With the company's proven earnings stability, an 8% FCFY(Free Cash Flow Yield) would not be unreasonable, and adding back the large cash balance, this company's market value could double in the next few years. AlphaNinja - US stocks will open slightly higher, as better than expected home sales data is giving people optimism. Lowe's and Burger King are among shares trading higher. Obama will ask Ben Bernanke to stay on as Fed Chief. Nokia playing catch-up to Apple in the "movie-capable" phone market. Hotel chains dropping stars (reducing service) in order to save money. Thanks to cost advantages, China is taking the lead in solar production. AlphaNinja - Maxxam Inc. (MXM) has an interesting idea for cost-cutting -->> suspending the filing of SEC statements. "HOUSTON--(BUSINESS WIRE)--MAXXAM Inc. (NYSE Amex: MXM) announced that it will convene, as promptly as practicable, a special meeting of its stockholders to approve, subject to final action by the Board of Directors of MAXXAM Inc. (“MAXXAM” or the “Company”), a 1-for-250 reverse stock split of the Company’s common stock and preferred stock. The purpose of the reverse stock split is to reduce the number of holders of record of MAXXAM common stock below 300, which will permit the Company to suspend its reporting obligations and deregister its common stock under the Securities Exchange Act of 1934, as amended. Terminating the Company’s status as a public company will allow the Company to realize substantial cost savings on an ongoing basis." I understand that small companies face exorbitant "public market" costs, at least relative to larger companies as a percent of their general spending. But SEC filings are what hold the company accountable to shareholders, so I'm not sure this is great news. -Stockholders who own fewer than 250 shares of common stock or preferred stock on the effective date will be entitled to receive cash (without interest) in the amount of $10.77 for each share of common stock and $11.52 for each share of preferred stock they own. Our Chairman controls the election of the Company’s Board of Directors. Charles E. Hurwitz, the Company’s Chairman of the Board, controls a majority of the Company’s common stock (the “Common Stock” ) and 84.4% of the Company’s total combined voting power. As a result, Mr. Hurwitz is able to control the election of the Company’s Board of Directors and controls the vote on virtually all matters which might be submitted to a vote of our stockholders. Revenues for our real estate operations are expected to decline for the foreseeable future. In 2005, our real estate operations realized substantial revenues related to sales of residential lots and acreage at our Fountain Hills, Mirada and Palmas developments. As the proceeds from these asset sales have not been redeployed to other real estate assets and there have been significant declines in real estate demand in areas where the Company operates, this level of sales activity is not expected to recur for some time. AlphaNinja - US stocks are off their highs but still up about half a percent. Among gainers are the mortgage enablers. Leading the losers is Tital International. Their tires are proving to last about 1% as long as expected, possibly because of dealers sabotaging them? Not good at all. The tires, which cost about $42,000 each, carry Caterpillar Inc.-built 797B trucks at oil-sands operations such as Shell’s Muskeg River Mine 270 miles (434 kilometers) north of Edmonton. Taylor, who in March said expanding into oversized tires would triple sales to $3 billion in five years, blamed the early failures on local dealers who set air pressure too low, raising internal temperatures and causing steel belts to separate. “The tire dealers up there demanded a 7 percent to 10 percent kickback, but I refused to pay it,” Taylor said. “If you don’t give them some money, they let a little air out of your tires, and no one sees it.” He didn’t identify the dealers. AlphaNinja - I was excited last Thursday to see a shareholder fight back against management walking away with a company on the cheap. Hugely upset shareholder Philippe Laffont provides more ammo to his argument that management and the board acted irresponsibly in approving the buyout. Maybe the best part is that Needham, the investment bank advising the board on the $28 per share deal, had a $38 price target last fall! I'm including his entire letter here, emphasis and color shading done by me not him. Friday, in another acknowledgement that the management/ Apax proposal is a bad deal for existing shareholders, RiskMetrics Group (formerly known as ISS), a leading expert on corporate governance and mergers, issued a DO NOT TENDER report recommending that shareholders not tender into the current offer. Furthermore, I find it extremely troubling to read in the report that despite attempts on RiskMetrics’ side, you and the board refused to meet with them, a highly unusual move. The RiskMetrics report comes on the heels of another independent assessment that was critical of the deal and the process by which it was approved: Steven Davidoff’s August 19, 2009 “Deal Professor” column in The New York Times Dealbook1. •There does not appear to be any immediate driver for a sale, and given the share price discount to relatively recent trading prices, the timing of the sale appears to be inopportune for shareholders. •The deal structure benefits the acquirer: Among other things, the breakup fee is higher than typical, the Company was not shopped aggressively, there is an expedited tender offer schedule and the shareholder approval requirement is below standard “best practice” for going private transactions involving insiders. Tom, why are there so many staggering and unanswered questions? Why would you sell at the low? Why would you sell during a financial crisis? Why would you sell when Apax, your buyer, uses the weak excuse of not paying more for this deal because they cannot finance it? Why would you rush this deal through with high break up fees, matching rights, and a low shareholder approval requirement? As I think about these questions, I think about all the ways in which management’s incentives differ from those of other shareholders and conclude this is the only reason you and Mr. Morse would support such a terrible deal. After all, Mr. Morse will get to cash out half his stake in the Company at $28.50 and still roll a large chunk of his after-tax profit in this deal. And most important, you and the rest of your management cohort have a chance to share in a whopping $120 million (or even larger) compensation pool. Not bad for someone whose 2008 total compensation from the Company was $685,000. In fact, the lower the price offered to the rest of us, the higher your chances of participating in the bonus pool - what an interesting and perverse effect! Your statement to me that shareholders are "lucky" to get $28.50 per share after you missed a quarter is naive and self-serving. It is naive to think the stock market would "punish you and bring your stock price to $12 or less" (your own words) based on your second quarter results. Many companies have missed earnings before you. Bankrate’s long-term value is based not on one missed quarter but on the long-term strength of its franchise and prospects for the future. It is self-serving because you needed the excuse of the bad quarter to rationalize an under priced deal born of a shoddy process. We obviously question the simultaneous timing of both announcements and note that you never gave the market the chance to value your company on the basis of second quarter results alone. How practical! Tom, you and your board have betrayed the existing shareholders while rolling your own equity into this new deal and negotiating a great pay package for yourself and your management team. Either you should have fought for a better price or you should have committed yourselves to continue to run Bankrate as a public company with a great chance of getting the stock back to the $40 range, 40% higher then your takeout price. 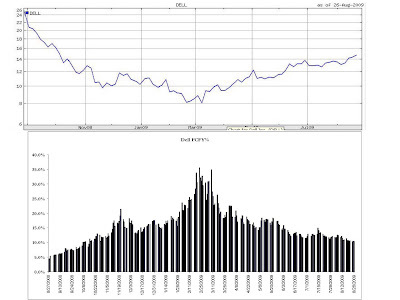 In fact, your stock closed above $40 per share on 125 trading days in 2008. At $40 per share, your stock would still be valued at a 6x 2012 adjusted EBITDA based on your own June 5 projections. RiskMetrics has come out against this deal. We continue to urge all shareholders NOT to tender their shares and to withdraw today any shares previously tendered. AlphaNinja - Charlotte Russe (CHIC), a mall-based young women's retailer, agreed to be taken private by private Equity firm Advent International Corporation. 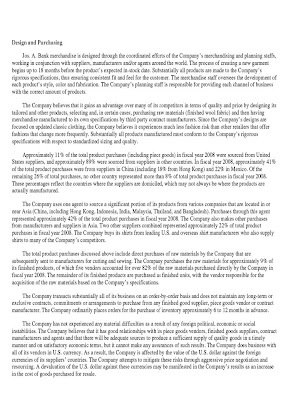 Management initiated a process to sell the company after being pressured by activist investors, and appears to have been in the right in arguing that previous offers were inadequate. Well done! The offer price is $17.50 per share, about a 27% premium to Friday's close. Charlotte Russe shares bottomed at $4 back in November, and at this morning's price CHIC shareholders have beaten the S&P500 by 23% over the last two years. Earnings estimates for 2009 and 2010 have been boosted recently, but still make the company's shares appear expensive, at a 2010 PE of almost 24. 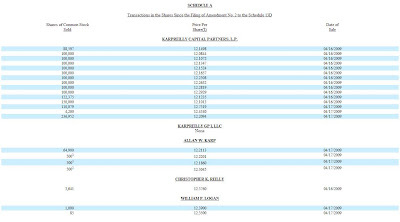 Worth noting is the company's sizeable cash balance of $60million, over $2 per share. The company has expanded its store base a little over 10% annually, and with 487 stores they're going to enter the "sweet spot" in terms of store age -->> older established stores will make up a higher % of their total, and these tend to be more profitable on a per-square foot basis. Also a positive is that the bulk of the capital expenditure phase is largely in the rear-view mirror, and big depreciation charges understate earnings. Earnings peaked in 2007 with net margin of 5% -->>the new owners will leverage lower private market costs, and the talent of former Old Navy president Jenny Ming, to improve upon that. Getting back to 2007 numbers in terms of sales-per-square-foot would get to maybe $30million in free cash flow - more if they slow store expansion and cut costs. There is certainly some great value here for the buyers, as that is a 10% FCFY(Free Cash Flow Yield) if you net out CHIC's cash balance. Under the terms of the merger agreement, an affiliate of Advent will commence a tender offer to purchase for cash all of the outstanding shares of Charlotte Russe common stock, and the associated preferred stock purchase rights, at a price of $17.50 per share, for a total value of approximately $380 million. AlphaNinja - US Stocks are about to open higher, following the lead of international shares which are up sharply. Back to the drawing board for Titan International, whose 13 foot truck tires ended up lasting 1% as long as expected. Sergey Aleynikov, arrested for stealing the code he developed for Goldman's trading operation. 5th Avenue's highest-grossing retailer? Apple. Private equity firms are severely hurt by "wipeouts," but they don't have to be fatal. NYTimes warns that investing in oil majors is not always the best way to speculate on higher oil prices. AlphaNinja - While it may seem a bit late to discuss bank bailouts, we're going to have many more on our hands in the months and years ahead. I thought I'd share two very smart opinions of how to deal with "failed banks." Thomas. M Hoenig wants us to avoid the mistakes Japan made in elongating their bank pain. He suggests models like Sweden used, and the US back in the day. Maybe the most reasonable suggestion yet comes from John Hussman of Hussman Funds. This piece is from back in March of this year. He points out that the government rushes in with taxpayer money because banks are in danger of becoming "insolvent." But this definition of insolvency simply includes equity (stockholders). He points out that bank debtholders should be on the hook too, as they're simply speculators higher up the capital structure (paid back first in a liquidation). We the taxpayer have effectively been paying to prevent bondholders from suffering losses. From the beginning of the recent crisis, starting with Bear Stearns, I have emphasized that nearly all of the financial institutions at risk of insolvency have enough liabilities to their own bondholders to fully absorb all probable losses without any loss to customers or the American public. The sum total of the policy responses to this crisis has been to defend the bondholders of distressed financial institutions at public expense. 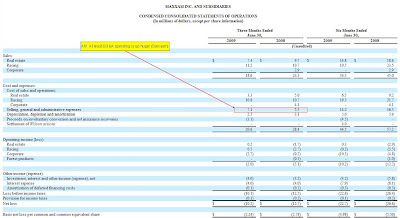 Note that in the example balance sheet above, 30% of the liabilities of the institution represent debt to the company's own bondholders. It is these individuals – not homeowners, not the American public – that are being defended by the promise of trillions of dollars in public money. For example, while Citigroup has approximately $2 trillion in assets, those assets are financed not only by customer deposits, but also by nearly $600 billion in debt to Citigroup's own bondholders. It is these private bondholders who provided the funds for Citigroup to acquire questionable assets. The bondholders of distressed financial institutions – not the American public – should bear responsibility for the losses of those institutions. AlphaNinja - This morning's existing home sales data was better than expected. The market loved it, as did the White House, which commented that housing was "bottoming." Maybe it has, but I doubt it. 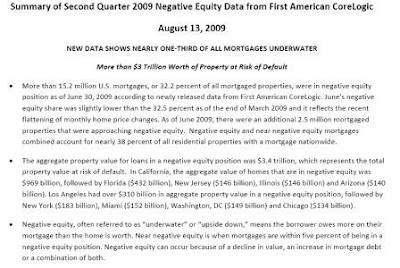 Below is a snapshot from a report on negative equity among mortgaged homes, courtesy of First American Corelogic. They note that as of JUNE, 32% of mortages are underwater, and another 2.5million are not far behind, psoosibly pushing the number to 38%. And that's as of June. We're likely headed towards at least a 50% number. The report doesn't mention it, but I would speculate that the majority of underwater mortgages were from the "vintages" of 2006-2007, so we're not looking at half of babyboomers' nest eggs being wiped out, fortunately. One thing is certain however -->> a lot of the loans on banks balance sheets will turn out to be wildly overvalued right now. AlphaNinja - Back in July I wrote a little about speculation that Dollar General would make a return to the public markets. It was a 2007 LBO by Kohlberg Kravis Roberts, and is now viewed as a rare win among LBO's from that "vintage" 2006-2007 timeframe, in which companies were taken private at very expensive prices because of very cheap debt. I believe now as I did then that operating results at Dollar General have improved amazingly, which is the point of an LBO. Now we get to the "exit" strategy for KKR. All IPO's are an "exit strategy" of some form or another, for venture capital backers, original employees, etc. Nothing wrong with that. But be especially careful in a case like this. Reading yesterday's S-1, the first bit of comedy is the company referring to the LBO transaction as a "merger." "Our common stock was publicly traded from 1968 until July 2007, when we merged with an entity controlled by investment funds affiliated with Kohlberg Kravis Roberts & Co., L.P. ("KKR"). We are now a subsidiary of Buck Holdings, L.P. ("Parent"), a Delaware limited partnership controlled by KKR. Our 2007 merger and the related financing transactions described herein are collectively referred to in this prospectus as the "Merger Transactions." "These initiatives also allowed us to expand our gross profit margin to 29.3% in fiscal 2008, up from 27.3% for the 2007 predecessor period and 28.2% for the 2007 successor period, and 30.8% in the first quarter of 2009 as compared to 28.8% in the first quarter of 2008. We had net income of $108.2 million for the full fiscal year 2008 and $83.0 million for the first quarter of 2009, compared to $5.9 million for the first quarter of 2008. Since our 2007 merger, we have reduced our total outstanding long-term obligations by $540.9 million to $4.1 billion, and we have had no borrowings under our revolving credit facility since the 2008 first quarter, having funded all capital expenditures and working capital needs from operating cash flow. In addition, at May 1, 2009, our cash balance was $434.6 million." -->> "We will not receive any proceeds from the sale of shares of our common stock by the selling shareholders." -->> "We have no current plans to pay dividends on our common stock in the foreseeable future. However, we anticipate paying a special dividend of approximately $200 million to our existing shareholders prior to this offering. This dividend will be paid with cash generated from operations." 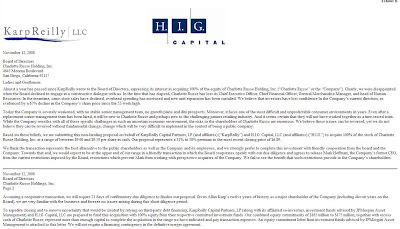 -->> "Upon the completion of this offering, pursuant to our monitoring agreement, we will pay a fee of approximately $64 million from cash generated from operations to KKR and Goldman, Sachs & Co."
RUN away from this "IPO." The company is receiving none of the cash. You are taking the "other side of the trade" from some extremely smart individuals who are trying to time this exit perfectly, as it is critical to show their investors they can still pull these leveraged transactions off. Most insulting is while puking their shares back to the public, KKR is taking $200million as a parting gift, out of the company's operating cash flow. And they're taking an i-banking fee??!! AlphaNinja - US stock markets are trading up a bit in premarket action. J.M. Smucker (SJM) surprised no one by beating Wall Street estimates for its first quarter. Shares up 3%. Great NYTimes piece on banks losses. Despite the rampant reporting on "toxic assets" and other exotic products, most banks are failing the old fashioned way - poor loan decisions. Russian dam tragedy highlights a crumbling infrastructure left behind from the Soviet days. AIG's new CEO, on why he took the position. (I LIKE this guy). Yikes. Paul Allen's troubles with Charter Communications may result in a $1billion tax hit, or 1/16th of his net worth. China plans to reign in the country's banks, who have lent money to stock market speculators rather than business owners. When institutional investors stayed away from CIT bonds, the company shopped them to less sophisticated investors, who're now sitting on over 50% losses.